Squires Gate Airport at the south end of Blackpool had international flights with Ryanair and Jet2 until 2013 when it closed except for light aircraft and helicopters. It used to be a horse racecourse and partly in St Annes but was taken over by Blackpool in the 1930's. At that time Blackpool Council was supporting an airfield located next to Stanley Park. This is now providing buildings for Blackpool Zoo. However Squires Gate was favoured by several airlines and a decision to develop it as the main airport was made. In the Second World War, Squires Gate and Stanley Park airfields were aircrew training and bomber manufacturing sites. Several thousand (3,841, ref 1) Vickers Wellington bombers were built at sites all over Blackpool. The very last Wellington was handed over on 25th October 1945 at Blackpool. In total 11,461 Wellington's were built at Weybridge, Chester and Blackpool. Amy Johnson flew her last flight from Blackpool and it is said she often piloted in to visit her sister who lived near Stanley Park. After the Second World War, Stanley Park Airfield was closed and Squires Gate became a Hawker Siddeley factory making the Hawker Hunter. 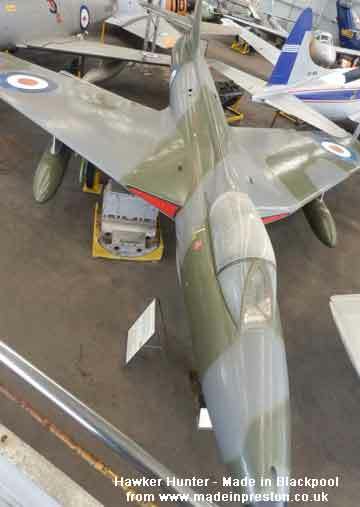 The Queensland Air Museum contains Hunter XF311 which was built at Blackpool in 1955. Ref 2 refers to: Contract SP/6ACFT/9817/CB 7a, issued for the second production batch of 100 Hunters to be built by Hawker Aircraft (Blackpool) Ltd. Built at Squires Gate, Blackpool as part of batch XF289 to XF324. XF311 was shop number 93. After Hunter manufacture ended in the late 1950's another use for the buildings was found in general manufacturing. The buildings are surprisingly large and nicely styled. Squires Gate had several ups and downs and several airlines started and stopped services over the years. Since 1995 it has been re-built with a modern terminal and airlines such as Ryanair and Jet2 operate flights to London, Ireland and Spain.